Calmly discussing your intentions can let him know that you are thinking of marriage. 4 What if Your Long Term Boyfriend Doesn't Want to Live Together or Get Married? After spending months or years getting to know one another, you are confident that your guy is the one for you. You may find that bringing up these thoughts to your partner leaves you feeling happy -- and frightened. While there are no guarantees that your guy will feel ready to go to the altar with you now or in the future, there are ways to gently let him know that you are thinking about marriage and a future with him. Think about what you want out of a marriage before you approach him about the future. Do you share a similar vision for the future, like whether you will have children or how you will manage finances? Getting the answers to these questions first can help you prepare for a marriage conversation. Practice what you plan to say to him in a calm manner. 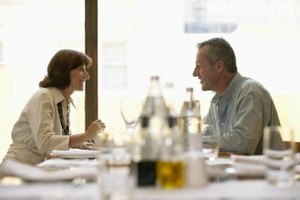 Going into the conversation unprepared can leave important things left unsaid, or you may get flustered and say things you may later regret. Discuss the issue in private by saying, "I feel happy with our relationship and excited for the future. I have been thinking a lot about getting married to you soon, and I wanted to know how you feel." Keeping your comments positive and focusing on getting his opinion in a calm manner can help during this conversation. Pay attention to what your partner says in return. Would he like to postpone marriage until he reaches a certain goal, like saving up enough for a down payment on a home for the two of you? Do you feel that his concerns are realistic? Remember to stay open to your partner's viewpoint -- and consider whether you can agree to discuss the prospect of getting married again at a later time. No matter how long they date someone, some men may never be ready for marriage. A previous relationship that ended badly, a desire to date other people and concerns about losing his identity and freedom may all mean that your boyfriend is not ready to commit, according to TwoofUs.org's article "A Little Thing Called Fear of Commitment." If you feel that these fears may prevent your boyfriend from getting married, realize that you may not be able to change his mind. You can suggest going to counseling together, which may help your partner address these fears. TwoofUs.org: First Comes Love, Then Comes Marriage...Right? How Do We Know If We're Ready? What If I Want to Date Other Girls Before I Get Married?